It is now clear that planetary systems around stars other than our own are common, and these extrasolar planetary systems display a stunning diversity of architectures, orbital geometries, and planetary sizes. Yet experiments such as NASA’s Kepler mission, which search for the periodic dimming due to planets transiting the face of their host star in edge-on orbits, rely on indirect detection techniques in which the presence of planetary mass companions is only inferred based on variations in the host starlight. However, astronomers are now able to directly image extrasolar planetary systems using a combination of new technologies described below. Indeed, this technique has now returned a large handful of directly imaged planetary mass companions at wide orbital separations. Just as the discovery of the “Hot Jupiter” 51 Peg b orbiting its host star at a small fraction of an Astronomical Unit (AU) came as a complete surprise in 1995, so have the recent discoveries of planetary mass companions orbiting stars at much wider (20–600 AU) orbital separations using direct imaging. While the indirect techniques such as precision Doppler and transit monitoring work to resolve the signal of an exoplanet in time, the technique of exoplanet direct imaging depends on separating the light from a faint exoplanet from its extremely bright host star directly in an image. However, as might be expected, imaging these extremely faint planets orbiting their host star is extraordinarily challenging: even young planets, still glowing from the residual heat of their formation, may be a million times fainter than their host stars. The task is analogous to observing a firefly fluttering around a bright searchlight. Now imagine trying to gather an image of this firefly while working in London with the searchlight located in Paris! This analogy accurately describes the sensitivity and resolution necessary for astronomers to uncover the faint light from these exoplanets. To accomplish this task, astronomers must first correct for aberrations and fluctuations in the incoming light due to turbulence in the Earth’s atmosphere. Just as the turbulent air above a stretch of hot concrete causes the image of a distant object to contort and vary in time, so too does the Earth’s atmosphere affect the signals from distant planets. Those of us working in the field of exoplanet direct imaging use a technique called Adaptive Optics (“AO”, see below). By spatially separating the light of a faint exoplanet from that of its very bright host star, the direct imaging technique can directly resolve the nearby environments of stars, and is thus sensitive to wide companions (tens or hundreds of AUs), probing planetary architectures out of reach of the indirect transit and Doppler techniques. An image obtained from the W.M. Keck Observatory showing a candidate planetary mass companion orbiting a nearby star. The light from the host star, located at the lower left, is being controlled using Adaptive Optics, and has been blocked by an opaque coronagraphic mask. The image of a faint candidate companion can be seen at the upper right. AO refers to a suite of customized optical components installed in a telescope, typically “downstream” from the primary and secondary mirrors (although several observatories are now building AO systems directly into the secondary mirrors to reduce the number of reflective surfaces). The task of this machinery is two-fold. First, it must use a “wavefront sensor” to sense the extent to which the turbulence in the Earth’s atmosphere has affected the incoming stellar light. Next, to correct for this distorted incoming starlight, AO systems use a “deformable mirror”, which is a flexible mirror that is continuously reshaped by mechanical actuators gently pushing and pulling the mirror hundreds or thousands of times per second. Once the stellar light has been carefully controlled using AO, astronomers use a “coronagraph”, a collection of opaque optical masks, to block out the host star light, similar to the moon passing in front of the sun during a solar eclipse. This combination of AO and coronagraphy provides the contrast needed to image faint exoplanets orbiting close to nearby stars. SPHERE is the extreme adaptive optics system and coronagraphic facility at the ESO Very Large Telescope. Its primary science goal is imaging, low-resolution spectroscopic and polarimetric characterization of extra-solar planetary systems at optical and near-infrared wavelengths. 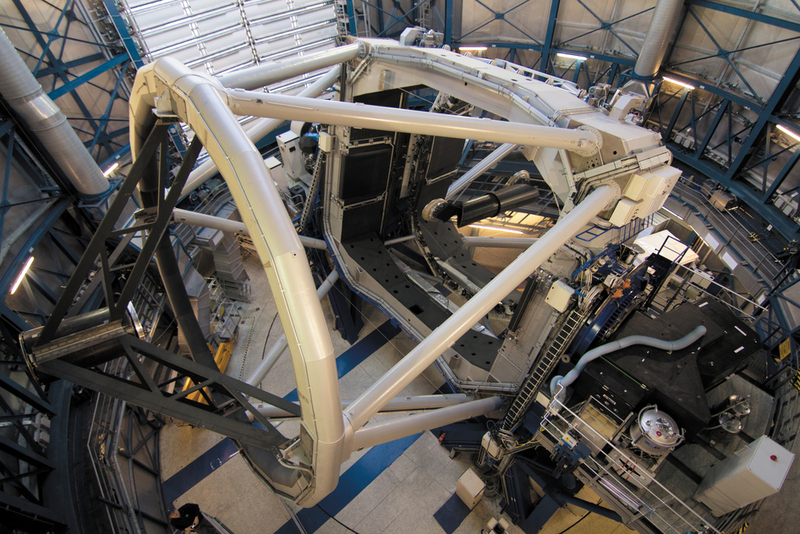 Here the SPHERE instrument is shown shortly after it was installed on ESO’s VLT Unit Telescope 3. The telescope fills most of the picture and the instrument itself is the black box visible at the lower right. Credit: ESO/J. Girard (djulik.com). Until recently, the handful of direct images of exoplanets, with orbits even wider than the outermost planets of our own solar system, were obtained with instrumentation not specifically dedicated to this task. Rather, they were obtained using instruments using some kind of custom setting or configuration allowing these extremely challenging observations to happen. Recently, however, several instruments have now been deployed that are dedicated exclusively to the task of obtaining images and spectroscopy of extrasolar planets. 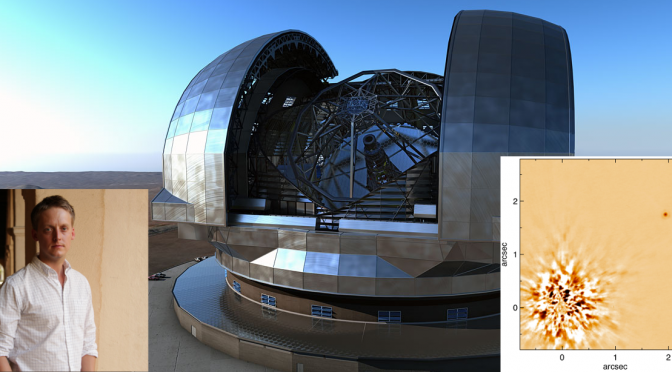 In addition to ongoing and planned suites of instrumentation at the Palomar and Subaru telescopes, the most notable projects are the Gemini Planet Imager (GPI), and the Spectro-Polarimetric High-Contrast Exoplanet REsearch (SPHERE) instrument, deployed at the Gemini South telescopes and ESO Very Large Telescopes in Chile, respectively. These instruments have embarked on surveys of hundreds of nearby stars that astronomers speculate could be ripe for hosting wide separation exoplanets. 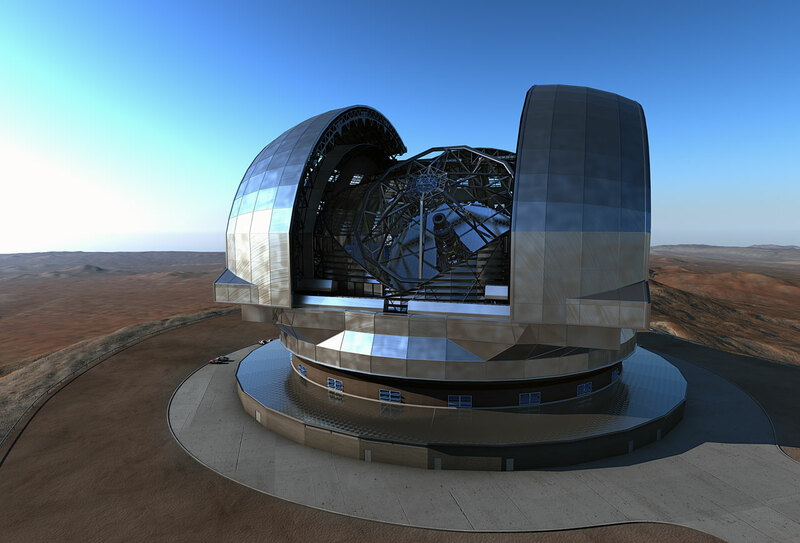 This very detailed new artist’s rendering shows the European Extremely Large Telescope (E-ELT) in its dome on Cerro Armazones, close to ESO’s Paranal Observatory in northern Chile. The design shown here is close to the final one, but some small changes are expected. While the images of exoplanets returned by the current and upcoming generation of instruments are particularly exciting, perhaps the greatest legacy of these instruments will be delivered by their ability to provide spectroscopy of the exoplanets. 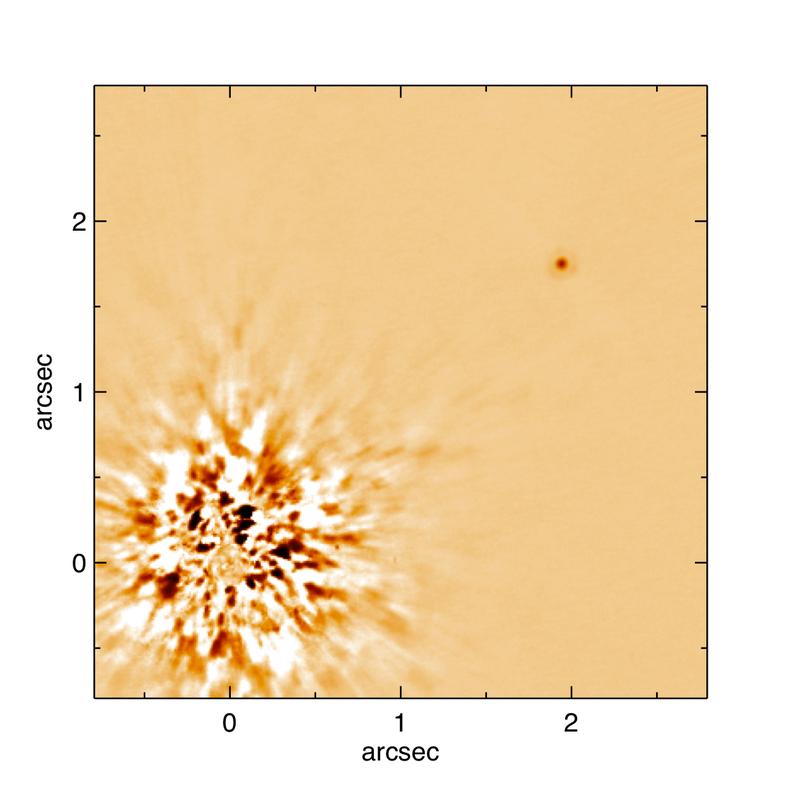 Unlike the transit technique, which fundamentally detects grazing stellar radiation after it has interacted with an exoplanet, by spatially separating the light of the host star and the extremely faint planet, the direct imaging method gives access to photons emitted directly from the exoplanet atmospheres. Obtaining photons directly from the surface of exoplanets will allow astronomers to gather all of the detailed information that has been retrieved for stars using high-resolution spectroscopy (e.g. chemical abundances, compositions, and thermodynamic conditions). This direct spectroscopy will allow unambiguous interpretation of the spectra. As such, the future of comparative exoplanetary science lies in the technique of exoplanet direct imaging. Sasha Hinkley is a permanent member of Staff in the Astrophysics Group at the University of Exeter in the UK. Prior to arriving in the UK, Dr. Hinkley was a NASA Sagan Fellow as well as a National Science Foundation Astronomy and Astrophysics Postdoctoral Fellow at the California Institute of Technology in Pasadena. 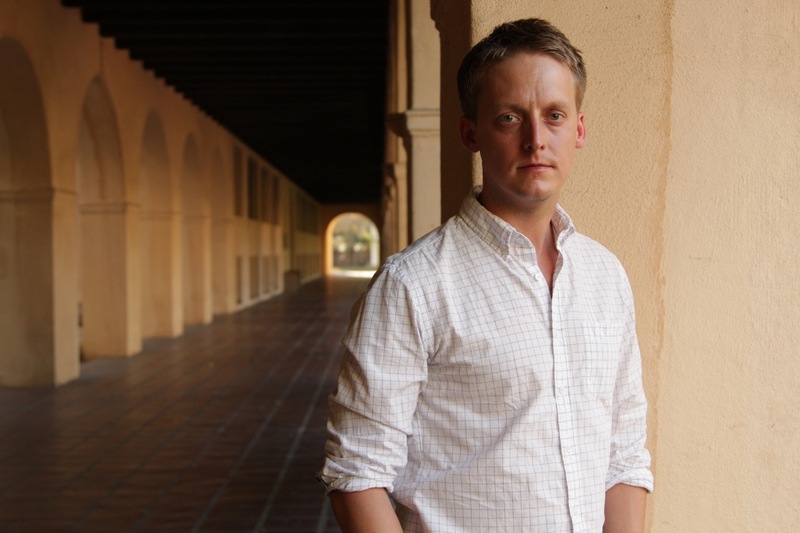 He has been involved with development of instrumentation for exoplanet direct imaging at Palomar Observatory, and is an active user of both the W.M. Keck Observatory on Mauna Kea, as well as the ESO SPHERE instrument at Cerro Paranal, Chile. I have one question: which star system appears in the image with caption “An image obtained from the W.M. Keck Observatory showing a candidate planetary mass companion orbiting a nearby star.”?